In coordination with Kitsap County Parks Department, the Kitsap Public Health District is removing its closure order for the Horseshoe Lake County Park swimming beach. Horseshoe Lake County Park reopened on Tuesday, August 14, 2018. The park was closed on August 1 after the Kitsap Public Health District received reports of people experiencing gastrointestinal illnesses after visiting the park in late July. The closure included the Park and its swimming beach only; there was no indication that any other parts of the lake were affected or needed to be closed. 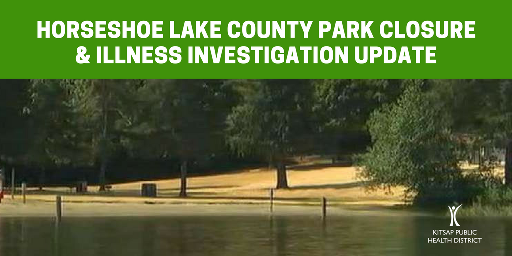 Kitsap Public Health District has concluded its investigation of reported illnesses related to exposures at Horseshoe Lake County Park swimming beach in late July. Park and swimming beach has reopened. Kitsap Public Health has investigated 155 reported illnesses. The park and swimming beach will reopen on Tuesday, August 14. Kitsap Public Health has investigated 148 reported illnesses. There is now lab confirmation of a norovirus infection in an individual who became sick after swimming at Horseshoe Lake County Park swimming beach in late July. This is consistent with our suspicion that the illnesses are associated with norovirus. The majority of those reporting illnesses visited the park on Sunday, July 29. Based on the onset of symptoms and incubation period, it is believed that a number of those reporting illness are considered “secondary cases” – people who got sick after exposure to another ill person. Horseshoe Lake County Park will remain closed for the week of August 6. While the Kitsap Public Health does not yet have lab-confirmation of a specific virus or bacteria responsible for these illnesses, symptoms are consistent with a norovirus outbreak. Because of the incubation period for norovirus-like illnesses, the length of time viruses can potentially survive in lake water, and because Kitsap Public Health continues to receive reports of illnesses after exposure to the Horseshoe Lake County Park swimming beach, the park will remain closed until further notice. Kitsap Public Health will re-evaluate the status of Horseshoe Lake County Park with Kitsap County Parks and Recreation on Monday, August 13, and provide an update at that time. Kitsap Public Health urges sick individuals to refrain from preparing food for others, swimming, or visiting public places while they are ill and for 48 hours after their symptoms are gone. Individuals are encouraged to frequently wash their hands with soap and water and use a bleach solution for sanitizing surfaces. It is important that people understand that norovirus is highly contagious. People can become ill due to exposure to the virus while caring for someone who is ill. Individuals with norovirus are infectious for at least 48 hours after their symptoms resolve. People can also spread the virus by returning to work, school, or daycare and by visiting recreational facilities or other public places while they are still sick or for 48 hours after symptoms resolve. People who are sick with diarrhea, vomiting, and/or stomach cramps should stay home from all activities and not prepare food for others for at least 48 hours after they recover from their illness. Frequently washing your hands with soap and water and cleaning surfaces in the home where someone is sick with norovirus-like illness is extremely important. A bleach solution of 1 cup of bleach to 1 gallon of water is recommended to kill norovirus on surfaces. This is a much higher concentration than normally recommended for sanitizing. In most instances norovirus symptoms will improve one to two days after onset. It is important to stay hydrated. If symptoms appear severe or do not improve within 24 hours, a healthcare provider should be consulted.